2018 Race Entry Deadline Extended to August 6! By popular request, the Rock River Anything That Floats Race steering committee has extended the 2018 race entry deadline to Monday, August 6 at 6:00 PM. We are already well over last year's entry total, but heard from several teams who had not quite made the deadline before registration was closed. 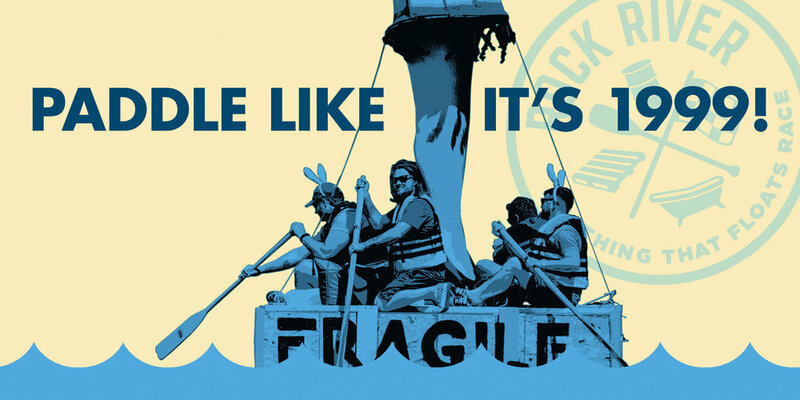 So, if you procrastinated just a little too long this year, paddle on over to our Rules & Regulations page for information and Registration page to register your raft online today. It's also not too late to volunteer to help on race day. Just visit our Volunteer page. Remember, land lubbers; new in 2018, is a new race category for Hulled Craft! From canoes to row boats to ski boats to pontoons, teams can use hulls in the creation of a raft, or just decorate a boat in a creative manner as they wish. 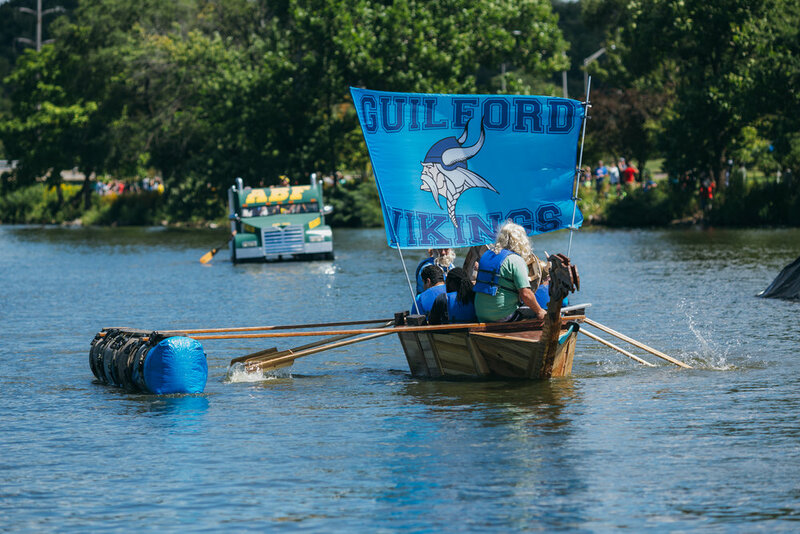 Hulled boats will compete against each other for speed in their own division and against DIY made-from-scratch rafts in the Judges Choice and Peoples Choice categories. NO motors are allowed. All raft captains, take heed! Remember to attend the Race Captains Meeting on Monday, August 6th at 6:00 PM at Prairie Street Brewing Co.
Also, Chuck-a-Ducks are still available at City Market at the B103 Radio Station booth, Prairie Street Brewing Co., BMO Harris Bank Center Box Office, the Go Rockford office and all Rock Valley Credit Union locations! Buying Chuck-a-Ducks is a great way to support the race and the causes the race supports - not to mention having a chance to win up to $1,000! 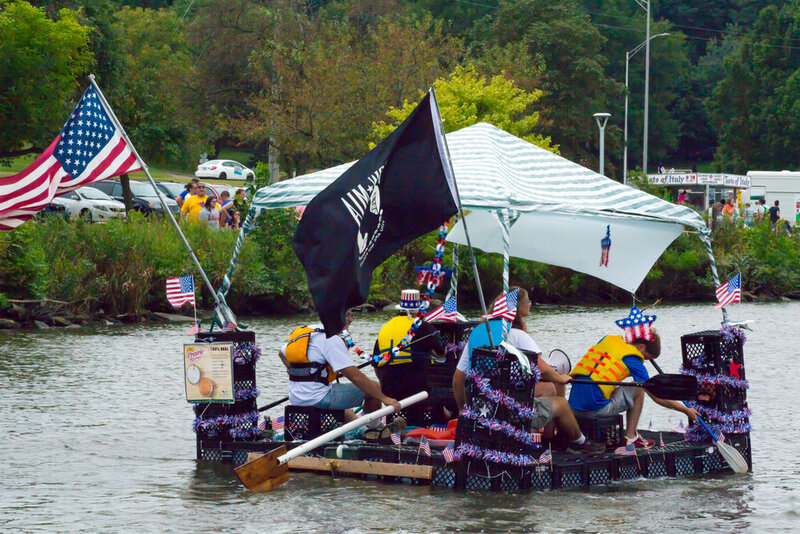 12:00 PM – Anything That Floats Raft Race begins! 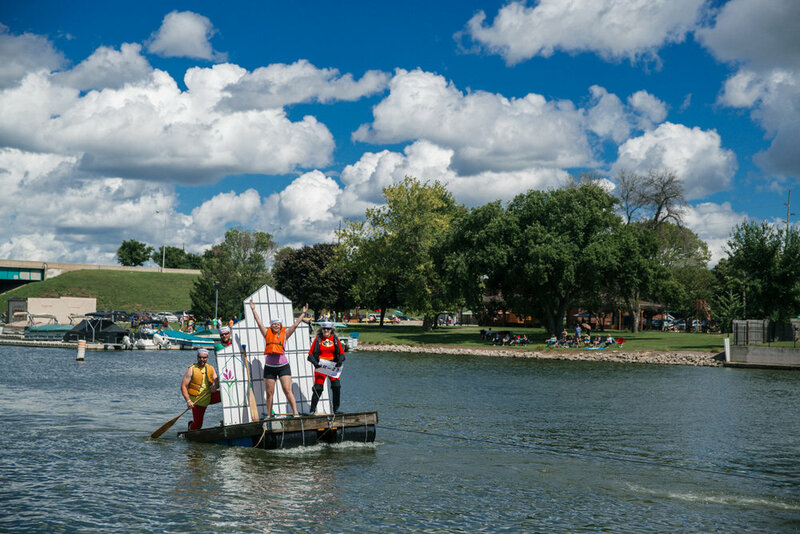 2016 Raft Race Gallery Has Surfaced! Attention all amateur shipwrights and raft-craftspersons alike! 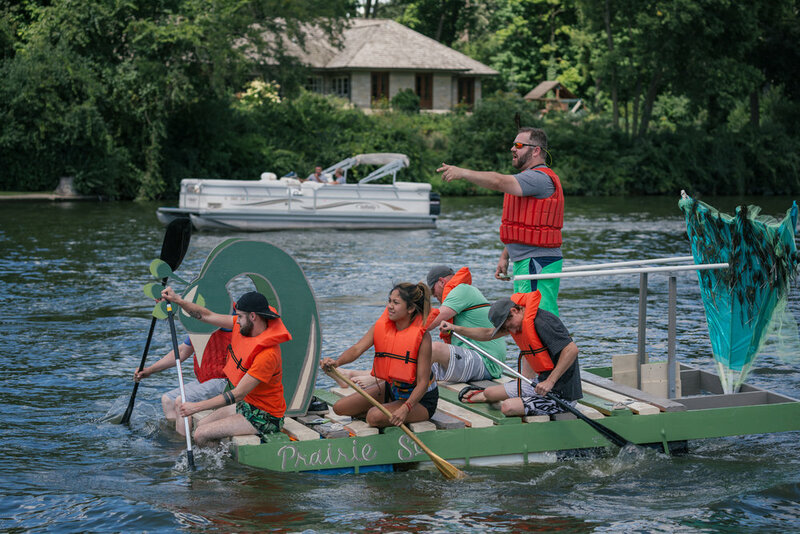 Your head is probably already swimming with concepts and blueprints for your team's signature floatation device, but just in case you need a little extra inspiration, we've found some photographic buried treasure: pics of the 2016 raft race have just been discovered! Behold! no ancient mariners these, but modern classics that carv'd a wake in which your crew and craft may follow! Rock River Anything That Floats 2017 Recap Video! Ahoy Racers and Future Racers and Spectators and Sponsors! We thought you would enjoy a little video recap of the 2017 Rock River Anything That Floats Race event. Check it out and share it with your friends. And, don't forget; it's never too early to get your ship together for this summer's race, happening Sunday, August 12! Announcing 2018 Race Details and Developments! Ahoy, mateys! 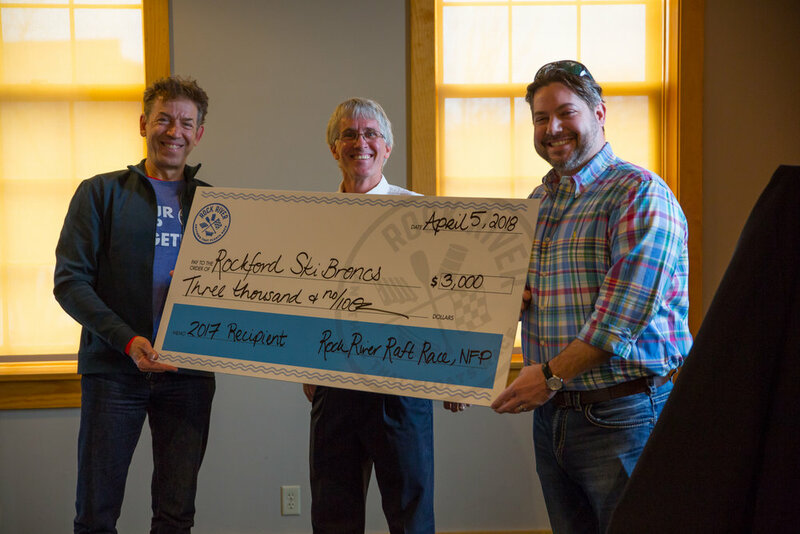 The Rock River Anything That Floats Race steering committee is happy to publish several announcements pertaining to the 2017 race fundraising results as well as formatting news for the upcoming 2018 summer event. 2017 race proceed checks for the other not-for-profit benefactors we support were distributed. 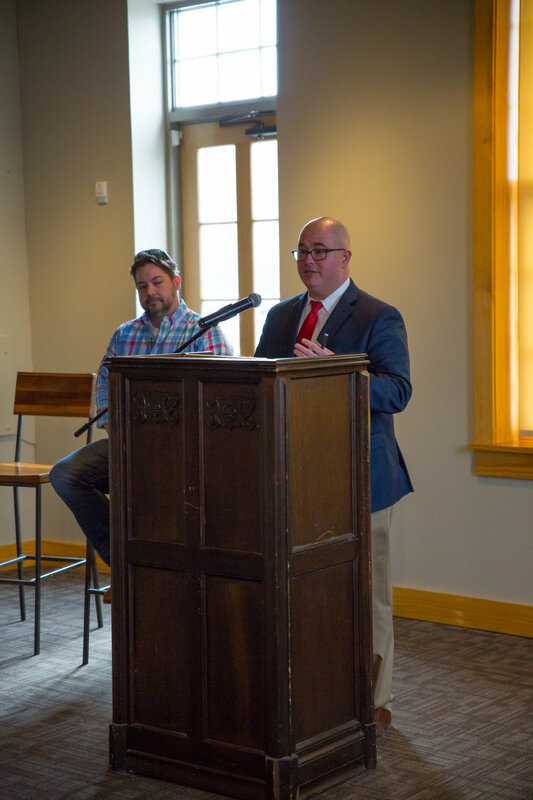 The Rockford Fourth of July Committee, Rock River Trail Initiative and Rockford Ski Broncs each received $3,000 checks. Thank you to all the sponsors, racers and volunteers who made 2017’s Rock River Anything That Floats Race a success! In other news, the Committee announced the creation of a new race category for 2018: Hulled Craft! From canoes to row boats to ski boats to pontoons, teams can use hulls in the creation of a raft, or just decorate a boat in a creative manner as they wish. 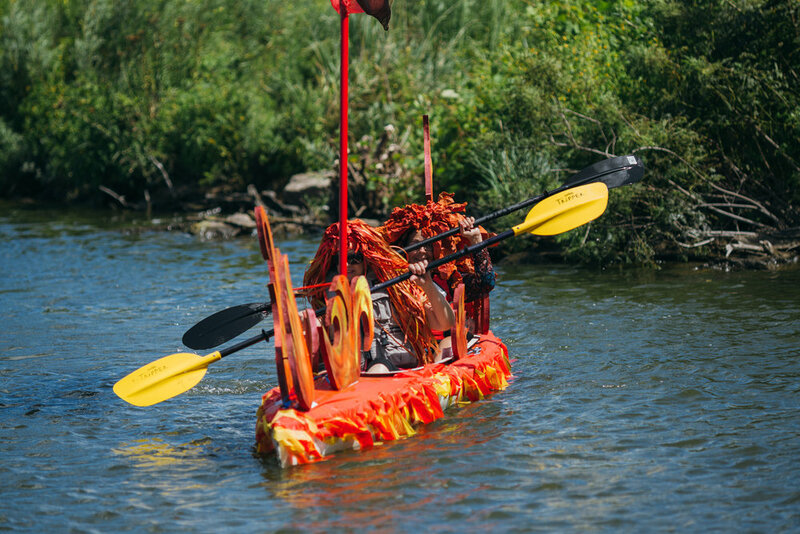 Hulled boats will compete against each other for speed in their own division and against DIY made-from-scratch rafts in the Judges Choice and Peoples Choice categories. NO motors will be allowed. Please visit our Rules & Regulations page for information and Registration page to register your raft online today! People interested in volunteering on race day are encouraged to visit our Volunteer page. Finally, please visit Rock River Anything That Floats Race personnel at the April 13 Rockford IceHogs game to purchase advance Chuck-a-Ducks to support the race and the other not-for-profit organizations we support in turn. Let’s go, land lubbers and seamen and women alike! 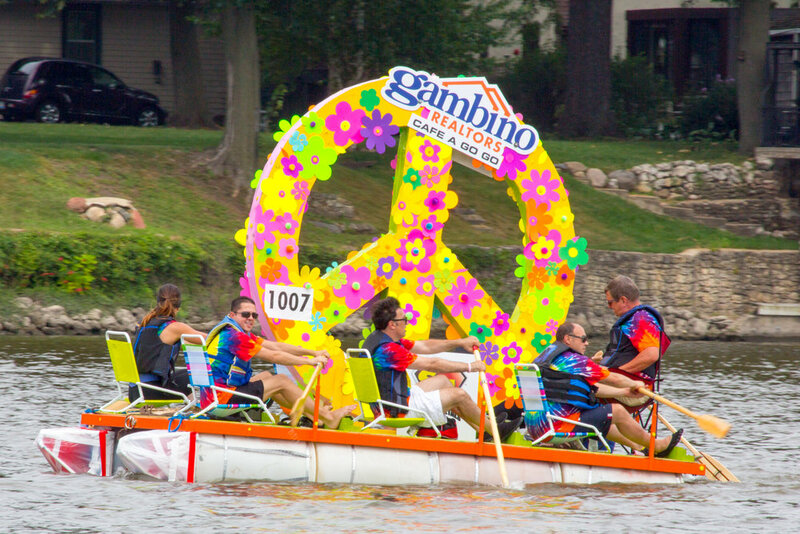 It is time to get your ship together for the 2018 Rock River Anything That Floats Race! Ahoy There! 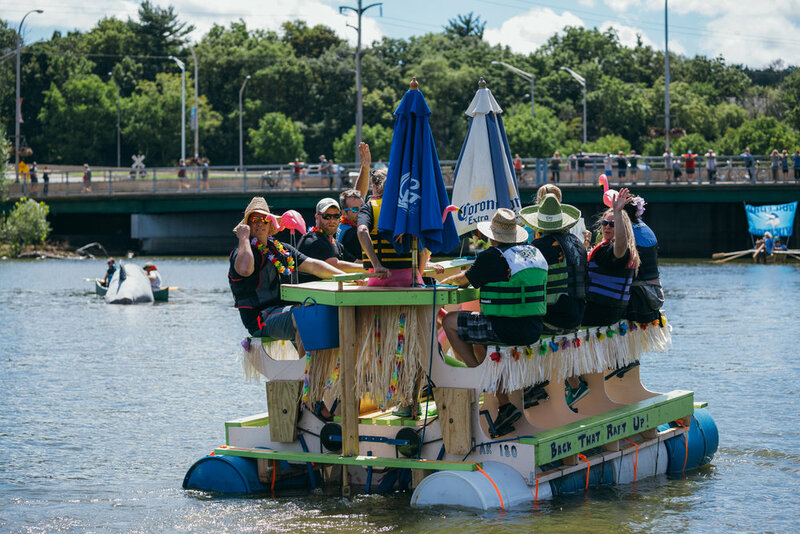 2018's Raft Race Will Take Place Sunday, August 12! One thing is for sure: you and your teammates will have fun designing, building and racing your raft, whether you're building it for speed or beauty or both. Please keep your eye on this site for registration information, which will be coming soon! 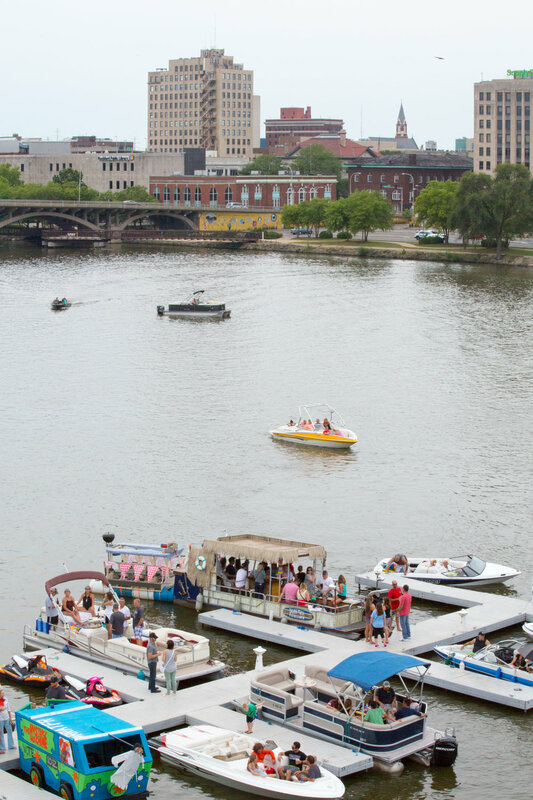 We can't wait to see you on the river this summer. Thanks to everyone who made the 2017 Rock River Anything That Floats Race a success! Our second year back saw many instant classic rafts parade downstream to the delight of thousands of fans. Browse through the gallery by clicking on the thumbnails below the main photo. Enjoy the photos and give some thought to the raft you might like to build for the 2018 race next summer. It's never too early to get your ship together!